To know me is to know of my obsession with love for all things wiener dog. I cannot help myself. I am just drawn to those little long dogs and have been since 1995 when I first fell hook, line and sinker in love with a long haired Dachshund I called Dixie Dog who was my constant companion and shadow for 14 years. And I have spent much time here on this blog talking about the Darling Dachsies we adopted nearly two years ago. Heck, they are even over there in my "about me" section. I dress them up and take pictures of them that I then sometimes post here on this blog which I realize probably causes some of you to throw up in your mouth a little, click quietly away as quickly as you came, or just chalk me up as being slightly off my rocker. But I know there are those of you who understand and maybe even find it somewhat endearing, either because you are an over the top wiener dog and/or animal lover and tree hugger type yourself or because you have a similar obsession love of something in your life that prompts people to wonder about your sense of sanity at times. I've talked here before about how I would love to be a foster for the dachshund rescue organization we adopted the Darlings from but don't because knowing myself the way I do, I fear I would just not be able to part with any of the precious little wieners I took under my wing and would thus find myself with a house full of them and then the cast and crew of that Animal Planet show, Confessions: Animal Hoarding would eventually come a knockin' at my door. Okay, that wouldn't really happen because number one, animal hoarding is cruel and number two, it's flat out disgusting. Have y'all seen that show? Well, I have and let me just say that I will not be hopping aboard that bus in this lifetime. I've also seen more than my fair share of Hoarders and Hoarding: Buried Alive episodes. I can't, no matter how hard I try, turn away from that madness. I mean, y'all, the dysfunction they uncover on these shows puts the Jerry Springer Show to shame. You just can't make this stuff up. Who are these people and why do they feel this compelling need to keep every stitch of clothing they've ever worn, every Q-tip they've ever stuck in their ear and every pizza box and stray cat to ever show up on their front porch? I mean...come on! Is this hoarding or is this extreme laziness? There's a thin line, people...a thin line. And yes, all that stuff really is in my house but none of it is on the floor covered in cat puke and/or goat hair, buried underneath ten year's worth of garbage, being gnawed on by sewer rats and multiplied by five thousand and two. Just as soon as A&E's Hoarders truck pulled out of my driveway. What would you hoard? Mama Kat wants to know. 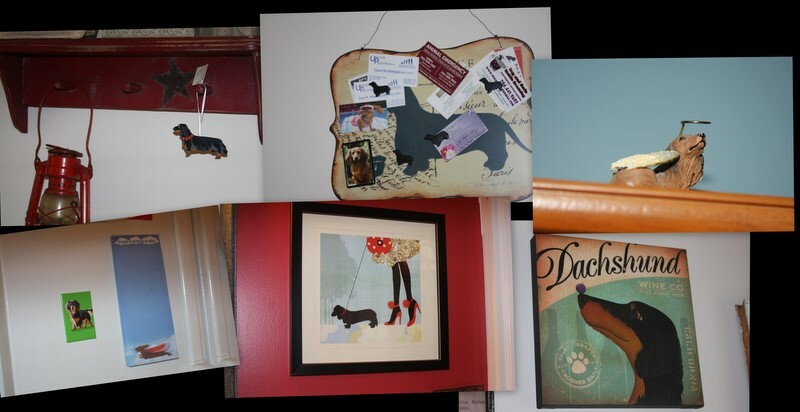 My mom had a weiner dog ... and then she got into collecting weiner dog paraphernalia too! It must come with the breed. Have you seen those Hot Diggity Dog collectibles? They are soooo cute. I even got one. Enjoy ... but don't hoard real animals. Confession: my mom is a hoarder. It's awful. Growing up in that home was exhausting. She didn't have ONE thing she chose to hoard...it was all sorts of knick knacks. While it's definitely not as bad as some of the people on the show...it's still an issue. My three year old says to me "Momma, Why nana and papa have junk in the house"...sigh. Ps. I I would hoard I would also hoard dogs...those stupid SPCA commercials make me cry every time. The best dog I had as a kid was my dachshund, Nikki. We got her from the Humane Society with this disclaimer: She's been brought back 3 times and was described as the Dachshund from Hell. But I had to have her and my parents agreed to do a weekend trial. To this day we still talk about sweet Nikki and how crazy it is that 3 families would have returned her! I loved that little dog! Too funny about dressing them up. I tried to buy our schnoodle a bikini at Target the other day. I mean, it was on CLEARANCE! Sadly, that idea was quickly vetoed. What a cute collection! I am so glad they are covered in hoarder stuff. Hee! love this. And have to admit that your weiner dog stuff is classy and cute! My obsession? Is books. So. Many. Books. Hoarders makes me want to clean my attic. I finally had to stop visiting both of them, and in some cases, stop all communication. It's so sad. Everything needs to be used or it doesn't stay. Period. I love your collection! Wiener dogs are so cute...I can see how you could easily end up addicted! If I was a hoarder it would have to be....dishes. But not the expensive kind. Just the fun kind. I would love to have plates for the different seasons. But they break to easily in my house at this stage of my life. So that hoarding will have to wait. I find it incredibly endearing!